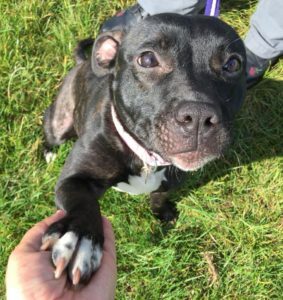 Isla is a super cute little 1 yr old Staffy girl looking for a home who know and love her breed! She is a real wiggly love bug who loves people, loves her cuddles and wants to be the centre of attention! Isla is OK with other dogs out and about if they are OK with her, but doesn’t want to share her home with another, so will need to be the only pet. She is a really clever little girl and knows some commands already, she works really well for treats and would love to attend training classes to learn more and keep her brain active – she has a lot of potential. As Isla is still very young, she is energetic, quite bouncy and needs a home where she will get plenty of exercise. She is housetrained and can be left for a few hours, but we’d prefer a home where she won’t be left too long due to her age. She can be rehomed with children aged 10+. Isla will make a fantastic dog for her lucky new family, she’s a little cracker!